Ok, I will admit it..I love outhouses. Why? I have no idea as I do not enjoy using them, but there is something that tugs ever so nostalgically at my heart when I see one. Perhaps, it is a genetic imprint or possibly simply a nod back to a not so long ago time when things were much simpler. Surprisingly, many people remember using these little rural treasures, which still dot the country side. I know, I always photograph them! Then, there are always stories associated with outhouses which involve peevish pranks. Someone is always moving the outhouse, roping it to a train, or something of that nature. It is always fun to be “privy” to such stories. I also enjoy all of the slang terms for outhouses..Johnny house, crescent moon rooms, water closet, shed, cludgie, earth closet, dunny, kybo, pot,can, lavatory,can, comfort station, John, commode, little girls room, little boys room, toilet, latrine, potty, WC, Mrs. Murphy, and some other not so lady like terms. Some are wallpapered with newspapers, catalog pages. Some are adorned with crescent moons for ventilation and some do not. Typically, if one wanted to be pretentious, they would furnish tissue paper for their guests, but most often people opted for the Sears Catalog, old newspapers, corn cobs (yuck! ), leaves, and Montgomery Ward Catalog. 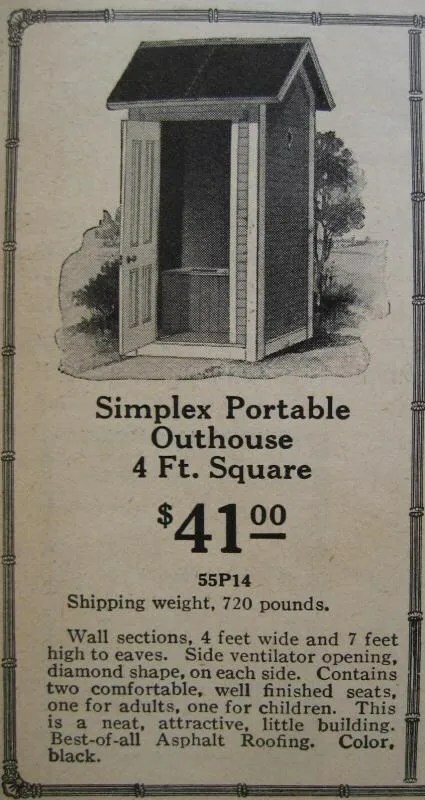 Ironically, both Sears and Montgomery Ward sold kits to fashion outhouses in their home catalogs! There is a plethora of obscure outhouse trivia as well. For example, did you know that the Mt. Elbrus is said to have the world’s nastiest outhouse? It is located at one of the highest points in Europe and is surrounded by ice and neatly perched at the end of a rock. YUCK. A stone outhouse, located in Colca Canyon, Peru is said to be the highest outhouse in the world. Argentina is said to have the world’s oldest public latrine… I digress.. The real reason for this blog is the double outhouse located in the rear portion of the Babb House. I want to save it! While this post is a tongue and cheek approach to history, please note that such edifices were once part of the rural landscape and are disappering from the culture. It wouldn’t be fitting to blog on the subject of Appalachian Ohio without addressing one of the most basic of necessitites. To me, it is the Cadillac of outhouses. It is a two seater. It was sometimes the practice for neighbors to share double outhouses and others claim it was due to how large many rural, farming families were. This particular one dates back to the early 1900s and could have been used by one Miss Nellie Sheridan herself because this property was onece owned by her mother in law, Jane S. Johnson Wilson, Wooo Hooo! What a distinction! It is a wooden structure, with a tin roof, double doors, and it is quite charming. Nonetheless, without further adieu, isn’t she a beauty? I really do need to start sleeping at night, but I just adore this wonderful throwback to yesteryear and find it beautiful in its simplicity. 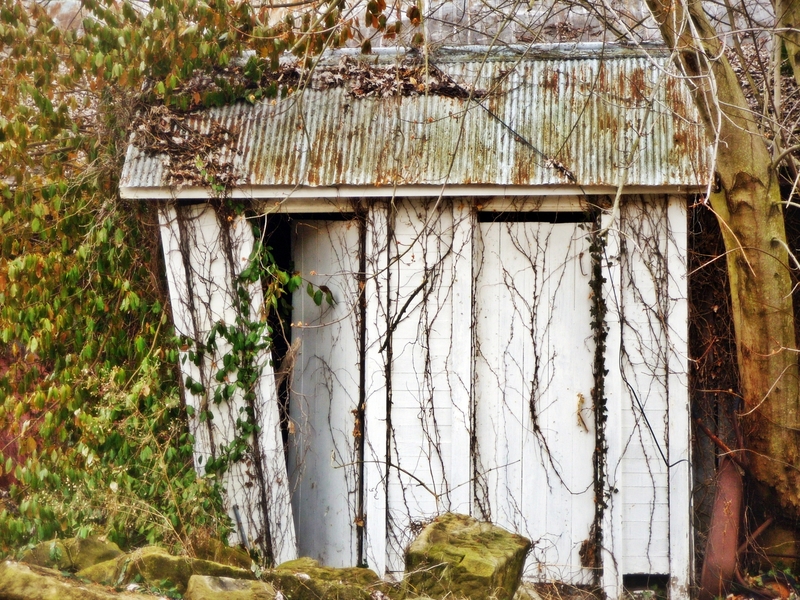 If you know of other Perry County outhouses, please leave me a comment. I would love to learn more about them. Thank you for reading my blog!